Moments of Mommyhood: I Would Miss A Lot! While watching the inauguration yesterday I was thinking. If I was at work I would have missed this amazing day in history. How sad I would feel not being able to witness such an important moment. Then I thought about all the other things that I would miss if I was not home with my kids every day. ...the early morning cuddles I get from Madelyn every day! ...having silly dance parties anytime the girls and I wanted too! ...baking cookies for the kids just because it's Wednesday! ...playing with play-dough all day long. ...and a million other moments that I could never get back! I know if I worked, I would be able to buy that big, new television or take a great vacation to a sandy beach for a few weeks in the summer. But for what I would miss, it is so not worth it! Those are just about the same exact reasons I chose to leave my career as a speech-language pathologist 16 1/2 years ago to be a stay-at-home mom...and you know what? I've never once looked back! Makes me think of that song by Kenny Chesney..."Don't Blink". Ditto.. but I will admit... since I have been home for 15 years... and my youngest will soon be 10... I'm getting a little antsy to go back... just a little. Holy Cow! No one would hire me!!! I need too much time with the kids! I had that day today too. It's good to get real and remember what our "other" job is. The best years of my life have been the last 13 at home with my kiddos! It's priceless! just think, if you did work and had the big t.v. you wouldn't be home to watch it!!! I feel the same way! Staying at home with my babies defines who I am! It's so nice to hear that you realize and appreciate the awesome responsibility you get to play our every day as a Mom! I was the breadwinner while Oby was going to school, when bam. It hit me. I had to quit and be with Chloe. She needed me. It was sooo scary and we gave up so many material things, but we have been given so much more. Mommyhood is the greatest paycheck ever! 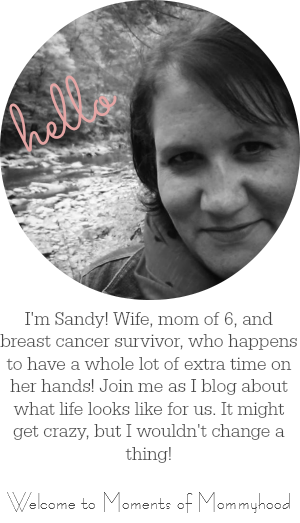 I gave you a bloggy award on my most recent post. You have quite a few so I was glad to have one that you didn't already. I love your blog and always appreciate your comments. You are a great blogger!